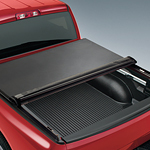 Another type of cover besides the camper shell is the tonneau cover. When using a camper shell, you may have to remove the whole shell in order to make sure that you are able to get the whole item into the vehicle. Tonneaus come in different varieties, such as canvas bed covers and fold up and roll ups. They are also less likely to reduce your gas mileage because they won't be faced with wind resistance. We encourage you to explore your used truck and SUV options at Perkins Motor Plex. We'll help you compare models and the features they contain so that you make a satisfactory purchasing decision.